Move over Sephora, I have a new favorite beauty destination! Amazon has seriously figured out the way to a girl’s heart. The ‘Buy It Now Button‘ is so good but oh so dangerous. The other day I caught myself ordering so much because it’s just so easy. AND THEY HAVE EVERYTHING. I think in my entire life, there is only about 2 or 3 things I have not been able to find on Amazon. Add in the free 2 day shipping for Prime objects and I’m hooked (+ broke 😉). Blackhead Extractor Kit ($7) – This little kit is so handy. It consists of 5 tools that help extract blackheads, blemishes and clogged pores. I actually ordered two of these so I can keep one in my makeup bag (especially while traveling) and one at home. It comes with a guide on when to use each tool but my most used is the one with a circle on each end. Organic Rosehip Oil ($20) – My skin is super sensitive but I love this oil. I use one to two pumps after my moisturizer. It makes my skin look so, so glow-y and moisturized. I especially love it on days that I’m not wearing make up because it makes your skin look so great! When I do use make up, it’s the perfect primer. I gave a bottle to my mom for her birthday and she loves it too! Tinkle Face Razors ($4) – My holy grail. I use these so much. I’ve probably reordered them 25+ times. I use them to take care of unwanted facial hair, removing dead skin and exfoliating my face. I have a full blog post on it here. The best thing about these razors is they remove al the peach fuzz from your face, making it so soft and smooth. Make up artists use these razors before big events for an airbrush look! Clear Make Up Bags ($13) – Whether it’s for storage or travel, clear make up bags are a game changer! I use them while traveling because it can quickly see what’s in which bag without having to dig through it for hours. I use them for hair products too! Antioxident Moisturizer with 50 SPF ($35) – I haven’t had this product too long but it’s already a keeper! I like how much SPF has in it + the caffeine makes your skin so tight. It also has a very light tint to it, just enough to feel that it evens out skin tone for days you don’t want to wear makeup! It doesn’t make my face greasy or shiny either, just a subtle glow! In case you haven’t noticed, I’m all about the glow lately. Mizon All in One Snail Repair Cream ($9) – This is another product I haven’t had too long but I am already hooked (I’ve had it less than a week and I just ordered a larger tube). I will report back once I’ve used this cream more but so far I’ve noticed softer skin + it has majorly helped my under eyes. I use it all over my face but I put extra all around my eyes. It’s helped with dark circles and under eye wrinkles and puffiness. The reviews rave about helping with everything from helping acne, scarring, pigmentation, wrinkles, dry skin – the list goes on! At $9 a tube, it’s going FAST. Mario Badescu Dry Lotion ($17) – Even though my skin has cleared up so much, I still get pimples here and there. Whenever I do, I use this Drying Lotion as a spot treatment at night and it dries it out tremendously. I’ve gone through five or six bottles of this at least and I’ll still reorder every time! It works so well. IMAGE Skincare Illuma Intense Lightening Serum ($47) – This is the priciest item on my list but for how well it works, it’s worth every penny! Two small pumps morning and/or night help with a clear, even complexion. It smells SO yummy too. The bottle lasts a while so while it’s something that costs a little more, you can use it for a while! Vital Protein Collagen Peptides ($15) – I’m a little late to the Collagen Peptides trend but I recently purchased and wanted to include it in my list! I’ve heard many friends, family and other bloggers rave about them. They are supposed to help with hair, skin, nails, joint and bone health + more. I’m going to mix them into coffee or smoothies. I’ll let you know what I think! Moroccanoil Restorative Hair Mask ($28) – I have dry hair by nature but I’ve been wanting to moisturize it more in hopes it will grow quicker. I originally picked up a sample of this mask when checking out at Sephora but fell in love, so I ordered this tub from Amazon. I noticed shinier, softer hair with healthier ends after just one use. I’m excited to see what prolonged use brings! Hum Vitamins (Varies) – I really enjoy these vitamins because the description tells you exactly what it helps. For example, instead of having to search what I need for a healthier liver, this one tells you on the bottle that is what it does. They also sell premade packets with a mix of pills that help get you ‘runway ready’, ‘clear skin’, ’21 day detox’, etc.. The packets are also great while you’re traveling because you can grab your exact amount. Not really beauty but can be helpful if you’re taking lots of vitamins, I recently purchased this set of 3 pill cases. I love the bright citrus look and it keeps me from forgetting a pill. All three are only $7 too! 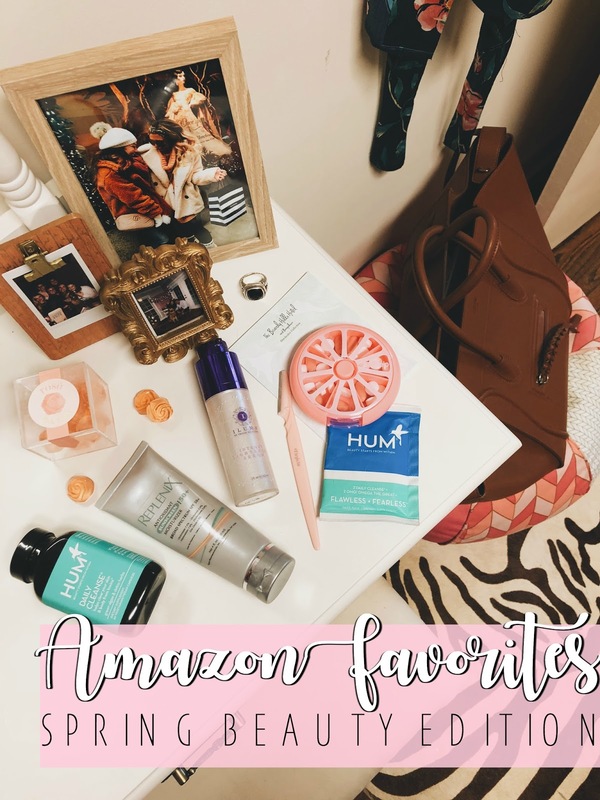 What are your favorite Amazon Beauty Finds?! I’m constantly looking for more to share with you! See my first two Amazon favorites posts HERE and HERE. I still love everything on the list!